Observe this peaceful scene in the Bethnal Green Rd, with its fine, newly restored Victorian terrace resplendent beneath a benign blue sky and cotton wool clouds. 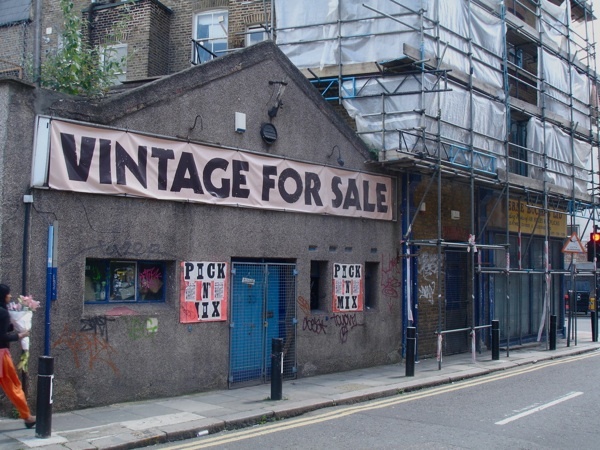 You would never guess that ten years ago these premises harboured London’s most notorious illegal gun supply – selling hundreds of lethal weapons to villains all across Britain at the rate of one a day. “They were supplied to the criminal fraternity, whether to be used in bank robberies, or to threaten people, or to kidnap people, or simply to shoot them,” revealed the prosecutor at the Old Bailey, speaking plainly, when the culprits came to trial in July 2006. It took a lengthy operation by a team of undercover detectives to discover that “Moderne Buckles, leading makers of air rifles, replicas, buckles, leather goods and accessories” was the hub of a supply and conversion network – the largest ever uncovered by the Metropolitan Police – yet even to the casual observer there was something fishy about the sale of buckles and air guns, which make an unlikely retail combination. When Ross Barry (of Lawrence M. Barry & Co, the largest textile recycling company in the South East) bought the property a few years later, he found some remaining gun parts in the basement which was once the centre of the operation converting replica pieces to active firearms. Yet of greater concern to him were the three tons of buckles left behind by the previous owners before they departed swiftly to gaol. “I think the business selling buckles to the local clothing industry had been established for many years, but it was failing and then the owner’s son-in-law got involved and it became a front for selling guns” Ross told me. 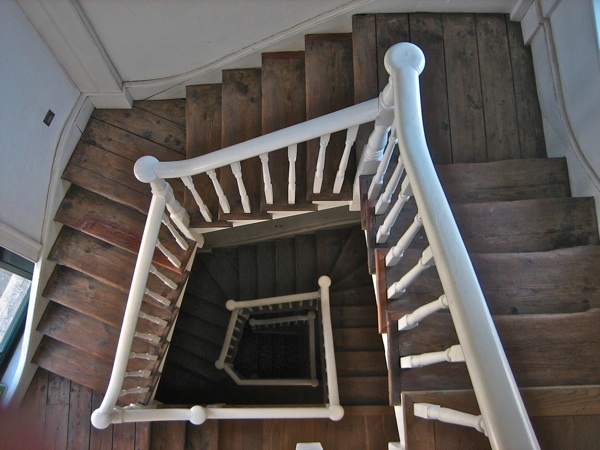 The building was left empty and “There were a couple of leaks in the roof, where they had simply moved the stock downstairs when the water came in.” he recalled ruefully as he took me on a tour, rambling up and down this tottering tower. Dating from between 1878 and 1883, when the Bethnal Green Rd was widened, 123 forms a bold culmination to the terrace stretching East that has also been spruced up recently – revealing an entire block which retains its original architectural form, dignified by elongated proportion and modest Italianate decoration. 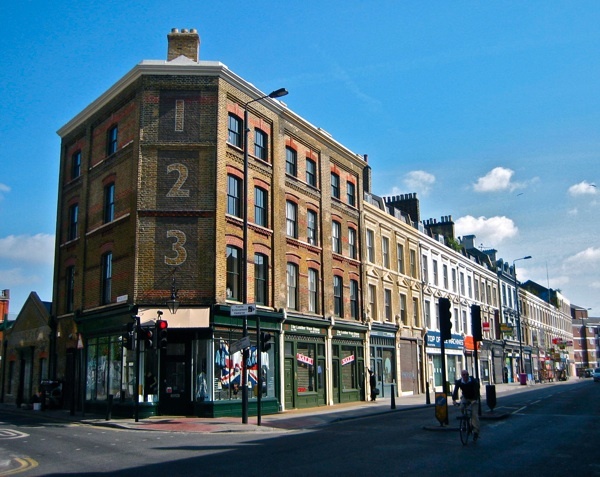 What architect Chris Dyson found at 123 was a building in poor repair, subdivided by partition walls and with an awkward twentieth century shopfront at street level. 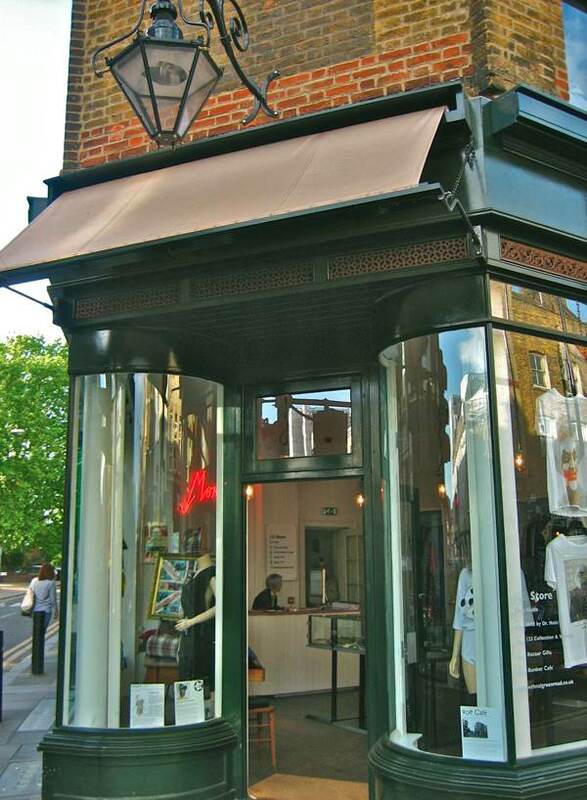 Under his supervision, the structure was repointed, the roof replaced and the windows remade, and working from precedents in the vicinity, a new shopfront was constructed matching in style and proportion with others in the terrace. Internally, the original staircase has been repaired and matchboarding replaced, while removing the partition walls opens up each floor as a single space, ideal as showrooms or workshops. The result is a nineteenth century building in tip-top condition, architecturally consistent throughout, serviceable and full of character. Rather than drawing attention to itself, the work that has been done leads you to look at the building freshly. Raise your eyes, next time you walk up Brick Lane – once you pass under the railway bridge – and you will see the numbers one, two and three newly emblazoned vertically in block numerals upon the end of the terrace in the Bethnal Green Rd beyond, visible in the centre of your vision at the top of the lane. 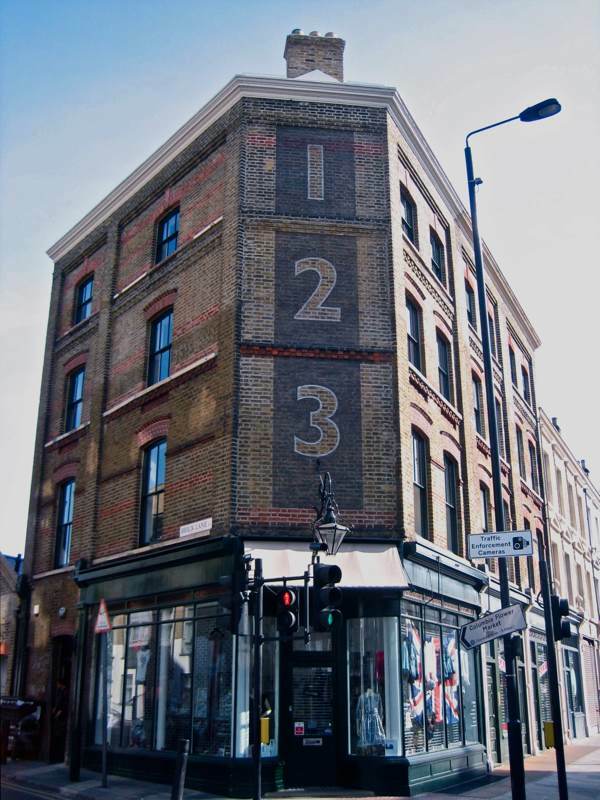 This distinctive landmark, now known simply as 123, is a favoured destination today for those seeking innovative fashions by new British designers, manufactured in London. 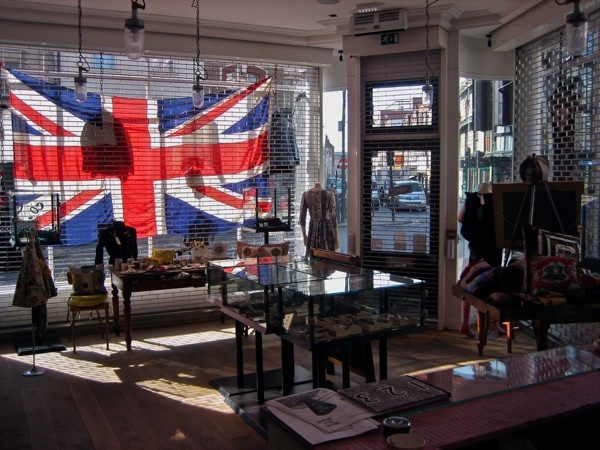 Here upon three floors stacked on top of each other, reached by a precarious winding staircase and offering views of the crowds down Brick Lane, is a twenty-first century department store with rails of clothes that have been “upcycled” – recut and individually embellished, retaining their history yet restyled to suit a contemporary sensibility. It makes perfect sense for Lawrence M. Barry & Co to explore imaginative ways to put old clothes back on sale, and the thoughtful restoration of this fine utilitarian building out of a former buckle company incarnates the change in East End textile manufacturing, from mass production to the small-scale designer operations that define the industry today. 123 Bethnal Green Rd has restored its reputation as well as its fabric now and, putting its criminal past behind it, has acquired a new life. 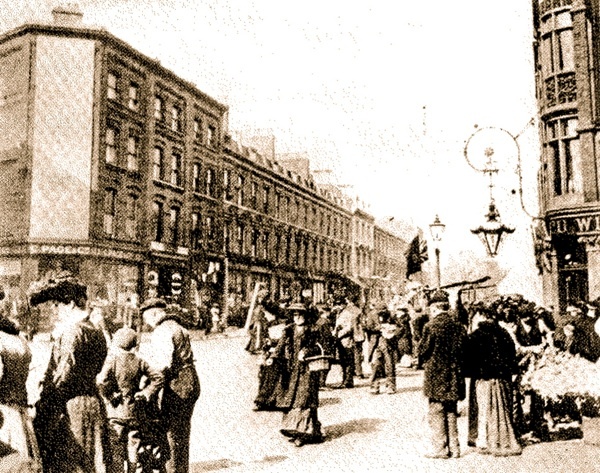 The view of 123 Bethnal Green Rd from the top of Brick Lane, a hundred years ago. 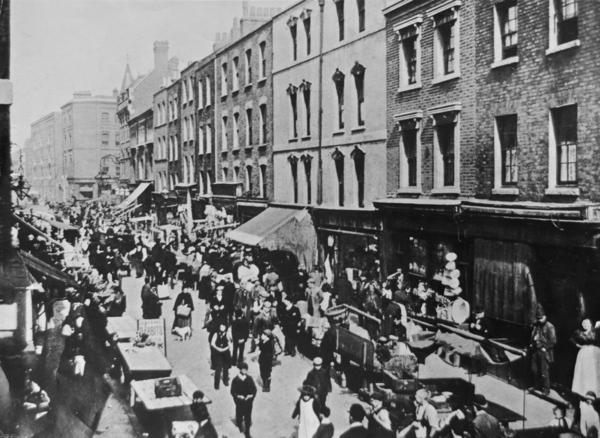 Looking up Brick Lane to 123 Bethnal Green Rd, a hundred years ago. 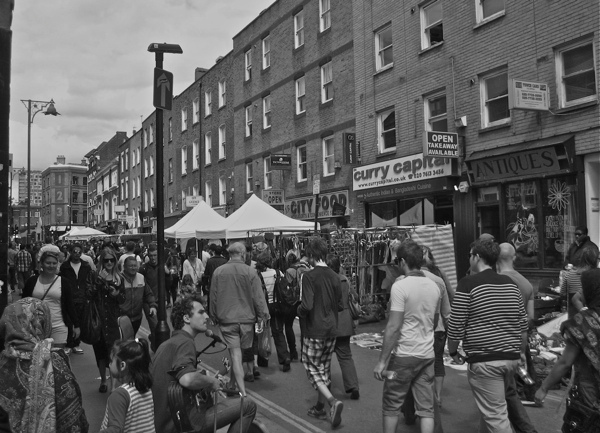 Looking up Brick Lane towards 123 Bethnal Green Rd today. The scout hut at the rear prior to renovation. 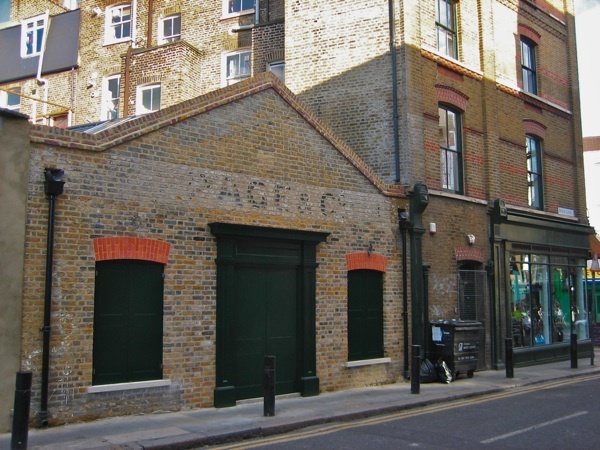 The scout hut today with original lettering of the former garage, Page & Co, uncovered. I know some people may object to re-creating the past, but looking at his work , all I can say is thank heavens for Chris Dyson. That staircase is fantastic. Imagine being the joiner tasked with working that job out! lovely to see this, thank you. We loved the busy street scenes. You are right in the centre of all the activity – a bit different to the quiet neighbourhood of our retirement village.